Learn needle felting with this beginner kit that includes everything you need to create the fun, colorful fish. 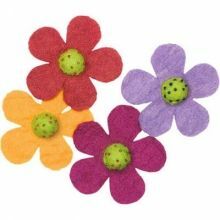 Contains 100% wool roving, wool yarn, cotton thread, printed acrylic felt, foam block, sequins, embroidery needle, two felting needles, and easy instructions. -- Finished Size: 4 wide (10cm)..